Over the course of two days the Japanese government’s powerful Ministry of Economy, Trade, and Industry (METI) endorsed development of new nuclear power stations and then denied that it had ever said such a thing. If you are reading the English language news media reports coming out of Japan about the future of the nation’s fleet of nuclear reactors, and the question of whether it will ever build any new units, you might want to take a deep breath. On June 8th METI told the Nikkei wire service that it was setting up a expert panel this month to “discuss new or updated capacity” for the nation’s fleet of nuclear reactors. Significantly, the wire service report did not cite a named spokesperson for the ministry. Now news speak by government officials in Japan may be different there than in the U.S., but when a high level government official calls a media report he doesn’t like “groundless,” it’s usually because someone let a very confidential cat out of the bag before its time. The root of this appearance of a split personality at METI appears to be the government’s strategic energy plan which has the role of defining the nation’s path to establishing a stable energy supply over the long term. According to Energy World, a trade journal, overall Japan’s energy use of all types of fuels has been declining and reached new lows for 2016. 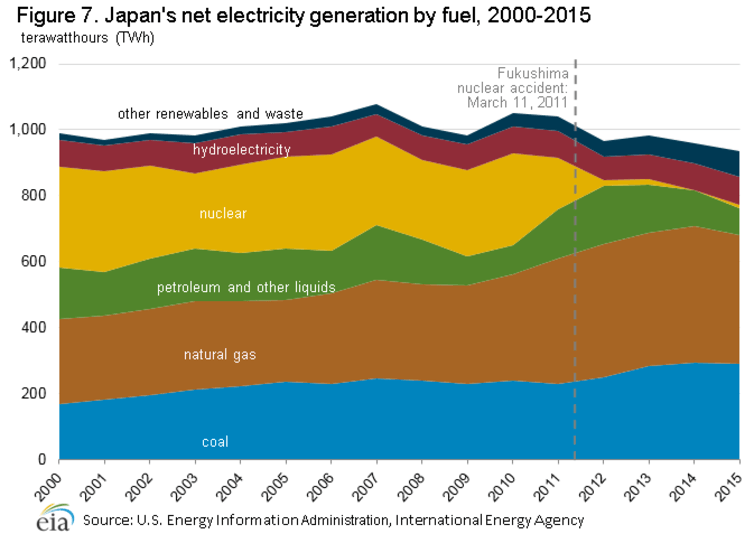 Rising supplies of renewable energy and the return of some nuclear power plants, amid falling demand as Japan’s population declines, mean the world’s third-largest economy has more diversity in its sources of energy. Thermal coal imports declined to just below 110 million tonnes in 2016, down from a record-high 113.84 million tonnes in 2015 according to the Ministry of Finance. Japan is the world’s biggest importer of LNG, gas chilled to liquid form for transportation on ships, and demand had surged to successive records after the March 2011 meltdowns at the Fukushima Daiichi nuclear plant led to the eventual shutdown of all reactors in the country. Shipments of liquefied natural gas (LNG) dropped for a second year last year, down 2 percent to 83.34 million tonnes, while their value fell 40 percent. 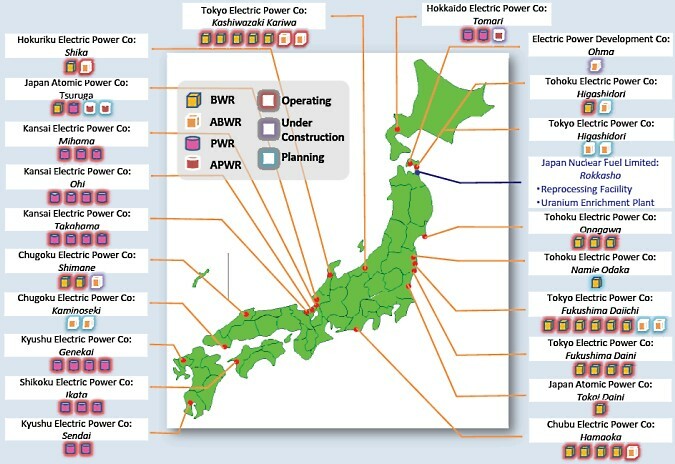 Despite these trends, the METI statement released on June 8th said that the strategic plan would focus on nuclear energy and would position it as an “important base-load power source” that is stable and and inexpensive to operate. How much nuclear energy would be needed over time is open to debate given the trend of declining energy use in the nation. Back in 2014 the Japanese government scrapped the goal of eliminating nuclear power entirely, announced in 2012, but remained silent on the issue of new construction. Another driver of nuclear power in Japan is that under the Paris climate change accord, Japan targets an 80% reduction in greenhouse gas emissions by 2050. Every year the government dithers over the future of nuclear energy makes it harder to meet that goal. The major nuclear power utilities have complained to the government that a lack of clarity makes it difficult to commit to long term strategies. A key item is that Japanese nuclear firms who want to export nuclear technologies to countries like India, the UK, and elsewhere would see an erosion of their capabilities, and workforces, if future investments in domestic nuclear power are frozen in the government’s long term plan. According to the Nikkei wire service, efforts by Toshibia to export Westinghouse nuclear technology to India has stalled due to the bankruptcy filing by that business unit. The plan, first agreed to in 2010, and since modified, was until recently focused on building six 1150 MW AP1000 reactors at site in Andhra Pradesh on the country’s east coast. Even if Westinghouse had not filed for bankruptcy, Toshiba, the parent firm, was plunged into financial turmoil when it was revealed it had falsely claimed $1.2 billion in earnings. “Conditions have changed due to Toshiba,” Takeo Kitsukawa, a professor at Tokyo University of Science told the Nikkei wire service. In the Japanese Diet, opposition to nuclear technology exports continues to muddy the waters. Some members of the Diet say that the agreement may offer insufficient legal guarantees that would limit their use to peaceful purposes. They point out that India is not a member of the Treaty on Nonproliferation of Nuclear Weapons and has refused to consider doing so.